Today is a day of 2s! Two new puzzles showed up (bday presents from my fantastic mother in law along with a new vinyl record!) and I found 2 new Big Boys! Ok, first thing is first, NEW PUZZLE DAY! These are really for M rather than me, but hey, always doing massive puzzles is hard, you need a quick little puzzle fix in the morning sometimes! First up on the list is Cupcake Heaven 1000pc from Master Pieces. 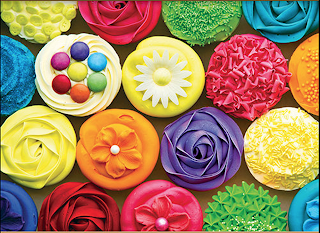 I really like this one, its super bright and makes me hungry. This will go in the kitchen for sure! 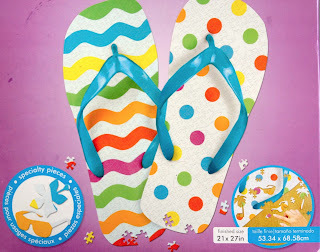 Next is a Flip Flop shaped 500pc puzzle of Flip Flops from Paper House! We are going to laquer this one and put it outside by the door so it looks like flip flops outside! Not only does it have a unique shape, it incorporates beach themed whimsical pieces like classic wooden puzzles. As far as the Big Boys are concerned, I found two more from Schmidt! I don't know for sure what the name of one of these is, but I think its Palmtrees. It's a 6000pc beach scene (very appropriate for us).